The W.C.T.U. met in Cong. church Oct. 21. Opened by singing "Nearer my God to Thee" and told how Mrs. Mornttot, a lady from Palestine explained it at the Convention. The Program Com. reported the Programs printed. 200 for $2.00. The sum allowed, $3.00 was set aside for prize for best essay in school. $2.00 was sorted for state thank offering and $0.50 for gift to Humford. The minutes were not read as the sec. was absent. Mrs. Stocks was appointed sec. program. 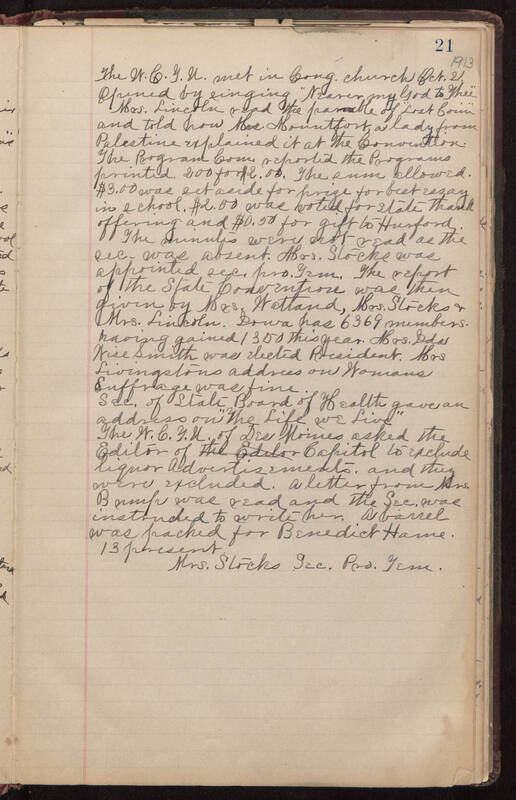 The report of the State Convention was then given by Mrs. Wattand, Mrs Stocks & Mrs. Lincoln. Iowa has 6369 members having gained 1300 this year. Mrs. Idas Wise Smith was elected President. Mrs. Livingstons address on Womans Suffrage was fine. Sec. of State Board of Health gave an address on "The Life we Live." The W.C.T.U. of Des Moines asked the Editor of Capital to exclude liquor advertisements. an they were excluded. a letter from Mrs. Bump was read and the Sec. was instructed to write her. A barrel was packed for Benedict House. 13 present. Mrs. Stocks Sec. Pro. Tens.